Jason and I got to spend Father’s Day weekend at Briggs and Stratton Raceway Park at the first Briggs and Stratton LO206 Cup race of the season. It was one of my favorite weekends so far. The only thing missing was my own Dad, who was home with the rest of the family. Though they were cheering us on via the internet and text messages. We were in for a lot of work, with this being our first real competitive run with two karts. It was all worth the effort. Jason has been racing and practicing most at Badger this year, but he has not yet used the 206 Cup’s spec tire, Vega FH Blue. Usually, we use Bridgestone YDS tires, which is the spec for most local tracks. The YDS tires are very hard and the karts tend to slide sideways (drift) as they fly through the corners. The Vege Blue is very soft and sticky, giving loads of grip to the track. This allows for faster speeds through corners but requires a different chassis setup. The drivers need to adjust their line, style, and speed to account for what has turned out to be a dramatic change in kart handling. After consulting with some experts, we made some adjustments to both of the karts on Thursday night and then spent Friday fine tuning. We managed to drop several seconds from our normal Badger lap times mostly due to tire changes but also due to changes in Jason’s driving over the last few weeks. He has gotten much faster, to the point were he is driving most of the track with gas held to the floor and just a touch of break to slow into the corners as he pitches the kart sideways. The Briggs Animal Sportsman class turnout was not the best, with only Jason and one other driver. We made the best of it though. We got some more laps in the kart and made small changes to the kart to try to eek out a little more speed and improve handling. In the end it was really just good practice for Jason. He was about one quarter of a second slower then the other driver, who also happens to be the Animal Sportsman class champion at Badger. Both Saturday and Sunday Jason took second place but was able to keep up, only dropping back when the other, more experienced teams’ tires really started to work. As the weekend progressed Jason’s extra seat time really showed and he made steady improvement in both classes. Jason’s second class, Briggs LO206 Sportsman, on the other hand, was great. It was everything that the LO206 racing is supposed to be. The motors are basically equal, so it is all about chassis setup and driver skill. The class had five very good drivers, all of whom Jason has raced before at one time or another. 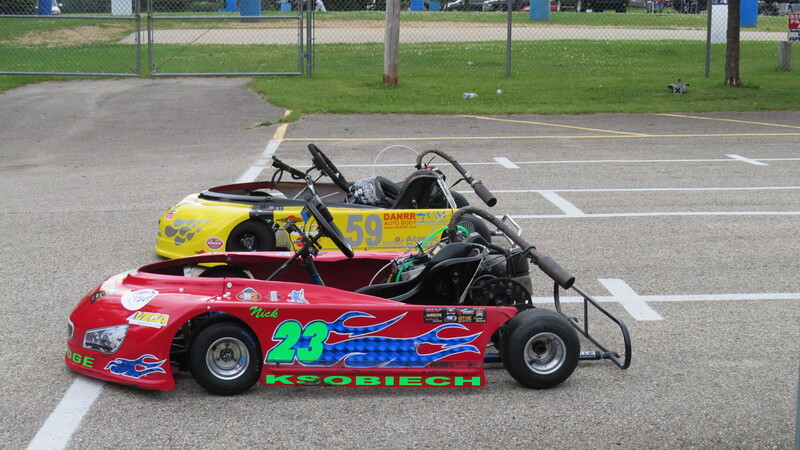 T heir mechanics all had done a great job of getting karts prepped. All weekend long these kids were running nose to tail with each other, each one of them in contention for a position. It made for some very exciting racing. Jason raced extremely well on both days. On Saturday he finished 2nd in the first two heats starting from the middle. The first heat was marred by a pileup in the third corner. Jason, who was in the lead, was tapped by another kart in the rear and spun, causing a chain reaction. 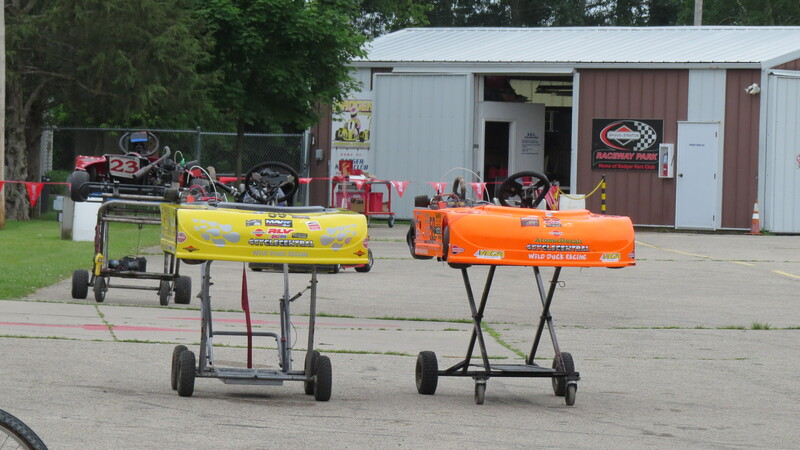 The resulting damage slowed some karts in the second and third races of the day. In the feature (on board video) he started in second and got a good start. Halfway through the race, the leader made a mistake heading in to the boot. Jason took quick advantage and moved into first. He led to the checkered flag, taking his first regional win! Sunday’s racing was more complicated. Jason started the first heat on the pole. His start was a little off and he dropped to second and stayed there. He started last in the second heat, picking up two spots by turn one, and finished third after a defending his line and trying to make it past the drivers in front. He started the 12 lap feature in 4th and was not able to make any progress but neither was anyone else. Those kids drove hard and pushed each other to drive smart and fast. All of their lap times were within a quarter of a second. Despite the lack of action it was very exciting. Jason is now in first place in the Mid-American Sprint Series and the Championship Enduro Series, and is in 2nd place in both classes in the Briggs 206 Cup. His Animal finish also puts him in first place for the CES/206Cup Challenge. After taking a few weekends off, on of July 11th and 12th we will be heading to Grattan Raceway for the next race with the Championship Enduro Series and Jason’s favorite track. Happy Father’s Day to Joe, and to Gary, who is very much missed here on earth. Thanks to T.J. Ross for this weekend’s support. It means a great deal to us. 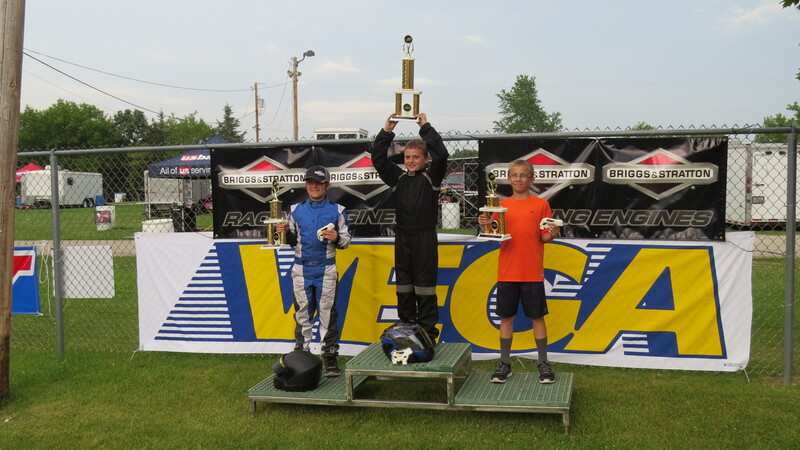 Thanks Steve, Greg, Briggs and Stratton racing, and the Badger Kart Club for putting on a great weekend. Regan at 4 Cycle Central – thank you for your technical support. Thanks to the Murray clan for feeding us chocolate and lending us tools. Payton and family – thank you for helping me keep Jason sufficiently rested and hydrated so we could race safely.